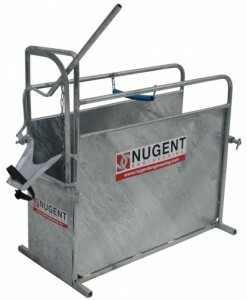 Quick and easy dehorning of calves in a simple one man operation. Once inside the crate, the calf is held firmly in place by a restrainer, comprising of nose band and pull chains. The crush is also designed with the capability to restrain livestock for castration, thus offering farmers two machines in one.